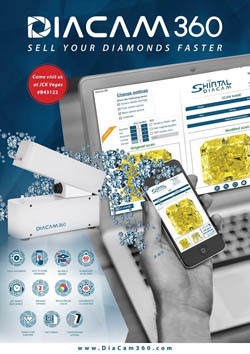 DiaCam360, the smallest, fully-automatic, portable, effective and affordable scanning device that within a few months after its launch in 2015 became the diamond market's most popular device for creating high quality, 360-degree photos and interactive videos of polished diamonds, will be welcoming new customers to the upcoming Las Vegas JCK Show, at booth B43122. "What a difference a year makes!" said Tal Volner, who heads the firm's branch in New York. "While last year, at JCK, we only introduced our 360-degree diamond imaging solution to the market, we now count an impressive string of companies among our clients, many of them industry leaders. These include firms such as Andre Messika, Julius Klein, Leo Schachter, Asian Star, Kapu Gems, Aloni Diamonds, Disons Gems, Yundor Diamonds, and GHI Gemological Laboratory is the first independent gem lab to use our technology and include DiaCam360 images in their grading reports," he said. He added that every day, thousands of DiaCam360 scans are shared via email, Facebook, WhatsApp and other social media platforms. The DiaCam360 can be seen and tested at booth B43122 in the Diamond Plaza, Bayside, Level 1, Mandalay Convention Centre, Las Vegas.